An Interview with Fr. Alfred Combe, conducted and translated by Rev. François Turner. I’ll tell you the story as it happened. My Comment : Msgr Venancio, Bishop of Fatima-Leira was the former President/Director of the Blue Army, In mid March, 1957, Bishop da Silva entrusted his Auxiliary Bishop Venancio with the responsibility of delivering the 3rd secret of Fatima to Bishop Cento, the Apostolic Nuncio to Lisbon. Bishop Venancio implored his bishop to finally read the Secret and to make a copy of it before sending the manuscript to Rome, we know from Bishop Venancio that this 3rd Secret is not very long and between 20 to 25 lines only, Bishop Venancio had also the Privilege of frequently discussing with sister Lucia. 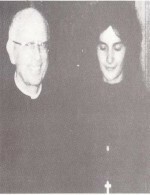 Most of Garabandalist are aware of the Bishop Venancio’s meeting with the main seer of Garabandal in New York but maybe few that the former Bishop of Fatima was asked to visit Conchita by Sister Lucia herself as indicated in this Testimony from Father Combe, who was one the main French Priest and leader of the Garabandal Cause, close also to the Pioneer, Father Laffineur himself. When Sister Lucia of Fatima herself, advise you to visit someone at the other part of the world, be sure that she knows about whom she is talking and this is surely not the devil or any of its friends. Here, we have another litte known fact confirming that the Bishop of Fatima as one the main Seer of the last century, Sister Lucia herself, knew about our Lady of Mount Carmel up to ask and meet one of her main Seer at the other part of the world. to appear in the skies, soon.” That was in 1997…18 years ago. The current increase in the frequency and intensity of volcanic, seismic and meteorological events are being well documented (non-mainstream). Earth is now under the unmistakable influence of “The Destroyer” (Kolbrin). Fr. Martin indicated that the events of the 3rd Fatima Secret would transpire within 20 years of the 1997 interview. Comet C/2017 K2 is UNPRECEDENTED in its opposing electrical potential relative to the sun and is due by 2023. A word to the wise…keep your eyes on the skies and an ear to the ground. Finally, somebody who has understood!!! Instead of becaming crazy in guessing the Grarabandal dates, we should start thinking about what Nbiru/Hercobulus/Planet X/Wormwood…(or wathever one wanna call this fasting approaching celestial body) will produce to our Planet and which would be the implications also for the Faith and the way it will be perceived in the future. Garabandal apparitions can only be reliable by reaffirming the same Truth of ever, otherwise they should be considered a work of Satan. I thought the video summarized the main points very well. Nice to hear Father Malachi Martin’s input again. His observation about the relevance of the Fatima Third Secret to the Garabandal Messages is a powerful testimony to the credibility of the Events.